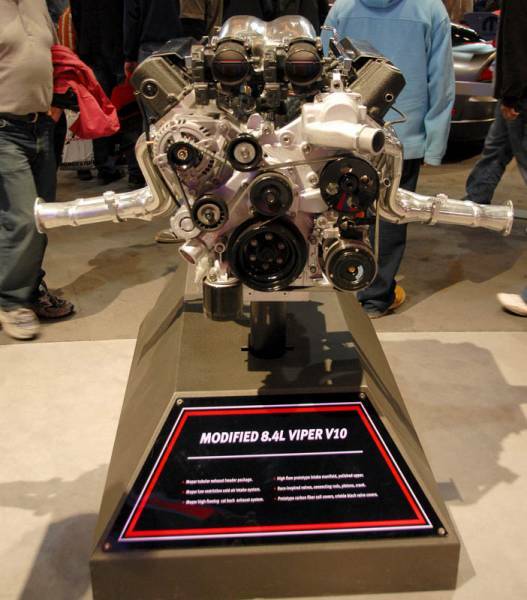 Custom Viper displays tweaks from Mopar Performance Parts � and 675 horsepower! Farmington Hills, Mich., January 9 /EXCLUSIVE from viperclub.org/ -- Much speculation has been made since the first details were released on the 2008 Dodge Viper scheduled to appear this week at the North American International Auto Show in Detroit. Of course today is the day you were supposed to be reading about it, however some magazine editions hit the newsstands � and websites � a little earlier. Viper buyers, already giddy over the addition of a whopping 90 horsepower (yes, 600 total ponies under that revised hood) still had one nagging worry in the back of their minds: What about this long-rumored �Blue Devil� from the �other� American super car camp? They needn�t have worried. In a surprise addition to this weeks show, DaimlerChrysler�s Mopar and SRT (Street & Racing Technology) Division have added a third Viper in concept form, joining the Venom Red SRT10 Roadster and Viper Red SRT10 Coupe with white racing stripes. Reminiscent of the SRT10 Carbon shown at SEMA in 2003, this latest Coupe variation showcases the many possibilities of this potent platform. The results? Well besides one of the most stunning Vipers ever to greet the public, it also satisfies the Viper faithful. With a few Mopar Performance parts and some additional internal engine tweaks the car makes an incredible 675 horsepower, with the torque climbing even more � from the impressive stock 2008 number of 560 ft lbs to a mind-boggling 650 ft lbs. You would be hard-pressed to find another exotic from any continent making those kind of numbers. Will these modifications ever make it to a production car? SRT will not comment on future product. But if what is shown here can be done by visiting your local Mopar parts counter, we already like what we see. Blue Devil shmevil!